Composite image of Prince Harry and Meghan Markle (Photo: Getty) with Trinity College's Old Library in the background (Photo: Fáilte Ireland). 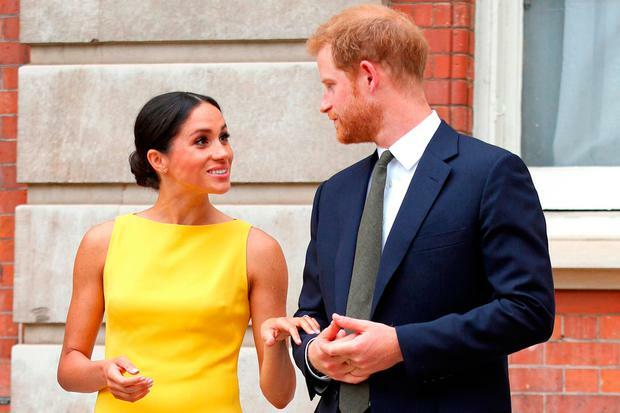 Irish ancestors of Meghan Markle will be detailed in family tree information to be presented to the new royal during her time in Ireland this week. She will receive the information when she and Prince Harry visit EPIC, the Irish Emigration Museum, in Dublin. Lorna Moloney, resident genealogist at Dromoland Castle in Co Clare, said she did not know the contents of the genealogical information that the Duchess of Sussex will receive when she visits Dublin but Ms Moloney has done her own research of public records concerning one aspect of the duchess's Irish ancestry. She found information that links Meghan to an Irish ancestor, Mary McCague, who was born in Ballinasloe in October 1829. Mary was the daughter of William McCague and Brigid Galaher. The information was sourced in Catholic parish registers which are available free online. Mary went on to marry a Thomas Bird, who was a soldier in a British Army regiment stationed in Ireland, Ms Moloney said. Down the centuries there were many marriages between Irish women and British soldiers stationed in Ireland. Ms Moloney said Thomas Bird was a member of a Cheshire foot regiment. Mary travelled with her husband when the regiment was transferred to Malta in June 1860. The couple had two daughters, Mary and Hattie, both of whom were born on the Mediterranean island. It is possible that they had more children, Ms Moloney added. Years later, the daughters ended up travelling across the Atlantic to North America. They would have entered Canada before later travelling south to the US. Ms Moloney said she did not contact any relatives of Meghan and relied on public records for her research. Ms Moloney derived information from the public marriage records in Massachusetts of Mary McCague's daughter Hattie Bird. Hattie was a sister of Mary Bird, a direct ancestor of Meghan. "The details available about army life of soldiers and their families in Malta is quite detailed. The regimental histories of the British Army can be very good sources for genealogists," she said. A spokesman for EPIC declined to comment on the details of the royal couple's visit to the museum.